Daniel Negreanue is a Canadian professional poker player who has left his own mark in the poker world. Negreanue has won four World Series Poker bracelets. Aside from winning bracelets, Negreanue won two World Poker Tour Championship titles. Daniel Negreanue’s parents were originally from communist Romania, and they later emigrated to Canada. Daniel’s parents had hoped to move to the United States, but they wound up settling in Toronto, Canada. Even from the age of four, Daniel knew that he was going to be rich and even told his mom how he would one day be rich and successful. In 2004, Negreanue was named the card player of the year. As of 2012, Negreanue’s live tournament winnings have numbered as much as $16,100,000 making him the best tournament winner of all-time. Negreanue even surpassed the prior leader, Phil Ivey. Part of what Negreanue has been famous for, is reading his opponents before even they play their hand. He also likes to push the bar a little higher each time with difficult challenges and regularly sets high goals. Aside from an avid poker player, Negreanue also enjoys playing golf and pushing the limits in everything. Negreanu owns his own poker website called Full Contact Poker. On there, he set up his own poker room where he was known as KidPoker. Full Contact Poker also has an active forum and an informational blog. 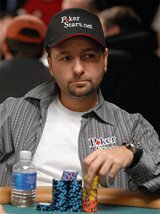 However, in 2007 as gambling laws at poker sites online became more restrictive, Negreanu moved back to Canada so he could play poker online. Full Contact Poker no longer has its own Poker room, but Daniel regularly goes to Poker Stars and competes there. Another one of the things that Negreanu is known for is his generous philanthropy. He has even made frequent appearances in the charity, Ante Up For Africa. There is no question, Daniel KidPoker Negreanu definitely has a talent that will continue to inspire and teach the aspiring poker players of tomorrow. What can they learn from him? Dedication, ambition and most importantly, a love for the game of poker.